Proton is a sub-atomic particle which is positively charged and has a mass of 1u. Alpha particles are helium atom with a charge of +2 as they have lost 2 electrons. 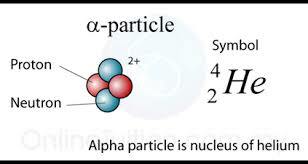 Alpha particles have an atomic mass of 4u. Gold is highly malleable and can be beaten into very thin sheets. 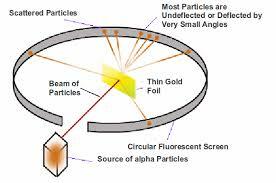 Rutherford took a very thin gold foil and bombarded it with high energy alpha particles. He placed a layer of zinc sulphide on the walls where the experiment was taking place because when alpha particles strike zinc sulphide layer, it results in illumination. This helped to determine the path of the alpha particles. Most of the alpha particles passed without any deflection. Some of the rays faced minor and major reflections. One out of 12000 rays retraced its path. Various conclusions were derived from this experiment. Most of the space inside the atom is empty as most of the alpha rays passed through the foil without any deflection. There is a dense and heavy particle at the centre of the atom known as the nucleus which is positively charged. Most of the mass of an atom is concentrated in this nucleus. Nucleus in an atom is like a small cricket ball kept at the centre of a large cricket field. All protons of an atom lie in the nucleus. The positive charge of the nucleus is due to the presence of protons. Nuclear Part: Containing the nucleus which comprises of protons and electrons. Extra Nuclear Part: Contains electron revolving around the nucleus. 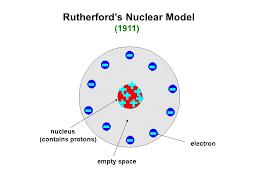 Rutherford could not explain the stability of the atom. Rutherford could not explain the line spectrum of energy. If an atom revolves around the nucleus in a spiral path it will radiate energy and in 10^ -8 seconds, the electron will collide with the nucleus, destroying the atom, but this doesn't happen as matter exist. That's it guys, hope you liked the content. If u liked the content please share and like and if u don't please leave a comment and for more content like this, subscribe to our newsletter.